I can’t remember a time in my life when I didn’t know and love my mother’s mother. My grandmother Opal (Robertson) Cottrell was a powerful force in the lives of all who knew her in her nearly 96 years — including but not at all limited to her many children, grandchildren and even great grandchildren. I can tell you what her voice was like. I can spot her handwriting at a distance. With long hair or short, with a smile or the rare frown, in a close-up or a distant shot, I recognize her face, her profile, even the way she carried herself. I know how her gravy and biscuits tasted. And I would kill for a chance to hear her laugh one more time. She is part of me, every day, even now, all these years after her death. But I had another grandmother. My father’s mother. And about her, in every way that matters, I know nothing. She is, and will always remain, a mystery. 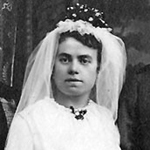 She married my grandfather, Hugo Ernst Geissler, in Bremen on Valentine’s Day 1918,2 and thanks to a few old photographs I can share with you here what she looked like when she married. She bore her first child in 1919, a daughter, Marie Emma, who lived only four months.3 She was just weeks short of her 29th birthday when she buried her only daughter. And Marie bore her second and only surviving child, her only son, my father, not even 18 months after burying her first. Once again, thanks to a few old photos, I know what she looked like around the time that second child was born. I have the papers that document her departure from the land of her birth and her travels to a new life in the United States.4 I know when the ship she sailed in with her husband and young son left Bremen and when it arrived in New York, and even where they were going and who they planned to stay with when they arrived in the Windy Cita. In other words, I know absolutely nothing of any consequence about my grandmother. My father rarely spoke of her. Stories that did get passed down tell a story of a stern and forbidding woman. But, I wonder, what else there was to know about her. What did her laugh sound like? Did she smile often or more often frown? Was she a good cook? And what dishes would she have served her grandchildren if she could have known us? Could she sew? Did she have friends in the neighborhood? Did she speak English well in her later years? What was it like, going to school in Germany before 1900? How did her life change when her mother died, when Marie was just days short of her 16th birthday? 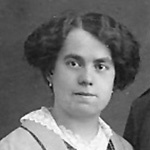 How did she and her family weather World War I? Did she mourn the daughter she left behind in that German grave? Did she regret not having gone back to Germany in the days just before the war to visit her father once more before his death? Did she ever regret coming to America? Would she have liked her grandchildren? Would we have liked her? But on this, her 122nd birthday, I can’t help but stop and think and wonder about this grandmother I never knew. And I can’t help but think how sad it is that there is no-one alive today who loved her… or can even speak to what that little line in her life was worth. Judy – my father’s mother also died many years before I was born & one year after my sister was born so she didn’t get to know her either. Luckily, my dad is still living & he has told me stories about his mom – as well as some of my first cousins (much, much older than I) – about her love for her church. I have pictures of her with her 5 sons surrounding her – with the boys (as young men) being goofy so I know she had a sense of humor. She raised 7 children & lost her 8th in a stillbirth. Thinking of these women we are connected to, yet didn’t get a chance to know – personally or through stories to give us a glimpse of their character – is so sad. Thanks for your wonderful psot! It really is sad, Wendy, but at least in your case you know people who know her and can tell you about her. I have never spoken to a single person, other than my father, who even knew my grandmother … and my father was really secretive about his family for some reason I will never understand. Now, of course, he’s gone too, so I can’t even sit him down and make him talk. I never knew any of my grandparents, as 3 died before I was born, and the last a year after my birth.. As children, we pestered our parents with questions, but they knew very little as 2 had died when my parents were children, one died just 4 months before my parents were married, and the last 3 years after. And that, in a nutshell, is why I love genealogy! – it’s finally answering some of those questions, and connecting me to long-lost branches of family, together with, making progress on some of the yet-unanswered questions! Wow… Nancy… I can’t imagine not knowing ANY of my grandparents — and having two die when your own parents were children! I think Marie does have someone who cares about her – through you. It’s a lovely tribute to this mystery Grandmother. I do care, Magda. But I don’t know her. And I sure wish I could. Your tribute to your grandmother is a tribute to your love and appreciate to her. I think what you’ve learned about her is of consequence! Don’t give up hope to finding more clue to her personality! Judy what a lovely post. Thanks for expressing the thoughts that we all have, but could not put together as well as you. But your last commenter is so right – by learning what you can, you keep the idea of her alive. I have similar angst about ancestors that are hard to know, and yet you feel as though there could possibly be a divide, if you really knew them. I always try to believe they lived in their circumstances and times, and we live in ours, but in many cases they were the people who MADE IT POSSIBLE for us to live the lives we live. You have to know that you are living the legacy that she gave you. That’s a lot to know. It is a lot to know, Diane. I’m just greedy. I want to know more. Jackie, I think she had siblings (family records suggest two sisters, perhaps a brother as well). But if so they were all in Germany, and German privacy laws make researching them complicated. But we should be soon in the time frame when that won’t be an issue, so… a trip to Germany is certainly in my future. As for the naturalizations etc., those were all done within the small circle of my father’s family who came to America — and every last one of them is long gone now. The only distant cousin I have in the US on my father’s side is as baffled by the lack of information she has on her part of the family as I am about mine! This is lovely. Thank you for telling us what you do know about her. Thanks for the kind words, Anne! >In other words, I know absolutely nothing of any consequence about my grandmother. My father rarely spoke of her. I believe that I have said it before, but I feel your “pain.” I think that I have told you about my great great grandfather and his first son. The son was born in Kilkenny, Ireland, but a specific birth location for his father is a mystery. That son had a daughter (two actually and a son, but I digress). That daughter was my grandmother. She was 10/11 when her grandparents died. When I was growing up, I spent sometime with my grandmother. I have heard more about her father and where she grew up from my father than I remember hearing from my grandmother. She hardly ever talked about her father and grandfather that I remember. Then again, she rarely talked about her sister and late brother. Dad talked more about them than she did or that I remember she did. The questions that I have for her. Jeff, I don’t know a single genealogist who hasn’t said: “The questions that I have for her.” Usually in an exasperated tone! Well, I didn’t have mine until well after she died when I got into my family’s history. There was about a 5 or 6 year gap. That may help ease the frustration a bit, for sure. I discovered a lot more than just names and dates and got to feel as if I at least knew a little about him. Good luck for your continued revelations on your grandmother. I love what you’ve done with this, Erica — a terrific focus for your project. Here’s hoping I can find something along these lines for my grandmother! And Judy – thanks for a lovely post. (I hope I can be forgiven for using [mis-using?!] this comment.) I’ll send you e-mail about the Gold family, as I finally made connection with their descendants. Oh yes… definitely, Kate! Getting just that tidbit about crocheting — wow. I’d love to have that much. Something specific, and humanizing, about her. I was lucky enough that I grew up living in my maternal grandparents’ home with my mother and brother. I had my grandmother for thirty-seven years until she passed in 2008. There were times that she was not an easy woman to live with, but we knew she loved us, especially as she got older. I did not know my paternal grandmother at all, and it doesn’t appear that she had much interest in myself and my brother, either. I don’t remember her ever contacting my mother in order to see how we were, and according to my mother, her parents felt that when you divorced your spouse, you divorced their family as well, so I’m pretty sure that she didn’t reach out to my grandmother. My paternal grandfather, however, had married a wonderful woman (he and my biol. grandmother had divorced some years previously), and we knew that “Granny Pat” loved us. My brother and I didn’t see her from the time we were babies until I graduated high school, when our mother took us to visit her and my grandfather. Even though my grandfather died in 2003, she’s still Granny Pat to us, and we still call her with family news. My biol. grandmother passed in 2009, and I still feel a twinge of regret that I know nothing about her life other than her name and her dates. I do feel quite fortunate that I was able to have two of my great-grandmothers in my life, on my mother’s side. I had my Grandma Wagner till I was thirteen, and my Grandma Brown until I was twenty-four. I remember Grandma Brown a little better than Grandma Wagner, but both were wonderful ladies. I just wish that I had been interested in family history while they were here. What couldn’t I have learned from them??? Wow! Two great grandmothers as well! That’s terrific, Lisa. Only one of mine was still alive when I was born and I wasn’t even three when she died, so I have no memories of her at all. Love your Granny Pat… what a lovely family story. Oh, the wondering and longing are palpable, and I share them concerning relatives now gone. Have you explored neighborhood possibilities where Ernest and Marie last lived? Were they devout Lutherans, and was the nearest church really the one now in Oak Lawn? If they attended that church, could they get there via street car on Cicero Avenue? Were they anyone’s Godparents? Did they have a car? Did Hugo work in war production? Was there a spate of ‘urban renewal’ in their neighborhood that prompted someone to write a neighborhood history? Did anyone do oral histories in that neighborhood — I know some did on the West Side when the expressways were put through and a vast multi-ethnic series of neighborhoods were demolished to build U. of Illinois “Circle” campus. The Newberry Library might be helpful in this respect, as might the Chicago Public Library, and there just might be a useful archive at what is now Wright State University. How did living so close to Midway Airport affect people in the neighborhood? Did they go to the museums due East by bus, on and near the University of Chicago campus? Did they go downtown for art, for the symphony? Did they take English classes at the nearest high school? It is useful to know that the South Side numbered streets are 1/8 mile apart, so from 63rd St. to 71st street is a mile; “Places” were in between the “Streets” and the north/south thoroughfares were mainly “Avenues.” I hope you have not given up looking for traces. Thanks so much for the encouragement, Jade. I’ll certainly add some of those suggestions to the list for my next Chicago research trip! Some of our ancestors are easier than others, John — and it’s the hard ones that keep us going, isn’t it??? Have her handwriting analyzed. I think she was artistic and a perfectionist. I wonder if the analyst would agree with me!